If the thought of rolling your $200 smartphone on your living room floor like it was a bowling ball or bouncing it off the carpet sounds less than wise, don’t worry. TheO has everything covered--literally. TheO, a smartphone entertainment package from Physical Apps made its debut at the 2012 Toy Fair in New York Sunday. It combines a bowling-ball-sized foam ball with smartphone apps that take advantage of the accelerometers built into most smartphones. Download a TheO apps into your iOS or Android phone, securely tuck it into the center of the foam ball, and you’re ready to play games like hot potato and bowling. For example, with the hot-potato game, the phone senses when the ball is tossed from person to person. 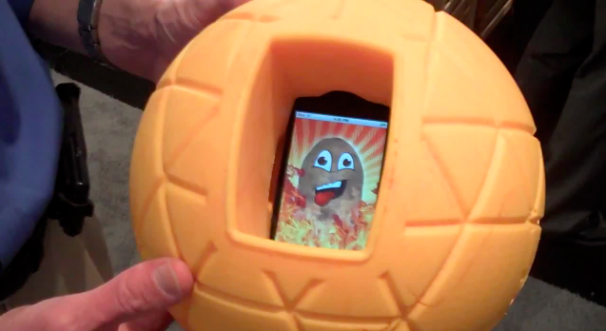 The goal, of course, is not to get caught holding the ball when the potato virtually explodes on the screen. The bowling game takes things further, allowing you to start the game on the phone and track the ball’s progress down a virtual bowling alley on a nearby TV. In both case the phone stays safely in the center of the thick foam ball. The TheO foam ball and three Android or iPhone apps will sell for $25. Additional apps will sell in the iTunes Store or Android Market for $1.99 for basic games, or $4.99 for enhanced apps like the bowling game, which takes advantage of a wireless connection. Other apps that encourage people to perform active tasks with their phone will be available later, said Bob Houvener, chairman of Physical Apps. He said it took about a year to develop TheO from the concept stage to the product that debuted at the Toy Fair, which continues this week.